Our eyes are one of the most delicate and important areas of our bodies so it is essential that we treat them delicately and with care. Nowadays it is all about convenience. We have access to a plethora of products which make it quick and easy to remove our make-up. The vast majority of us now buy make-up remover wipes or pads as they are time-saving and mess free, however they can be harsh on the skin and the sensitive eye area causing redness and irritation and leaving traces of make-up and tugging on our lashes. Women tend to spend a lot of time and care applying their make-up, yet they want to get it off as fast as possible and tend to do it with very little care or finesse. Removing our make-up is actually one of the most important stages of a good daily beauty routine so it is essential that it is done with a product that is right for your skin and not just one that is easy. 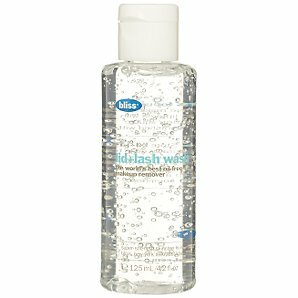 The Bliss eye make-up remover £11.74 does everything all at once. As well as removing every last trace of make-up it also works at soothing and de-puffing that delicate eye area at the same time. Those with super sensitive peepers don’t have to worry, because the gel formula ensures there is no danger of it dripping into the eye and causing redness and irritation.